Have you considered how students take notes in your lessons? Here are a few ways to adapt/change those common methods of yours to help? Students to divide their page into four. Head each box; Recall, General Information, Most Important Points, Exam links/questions. 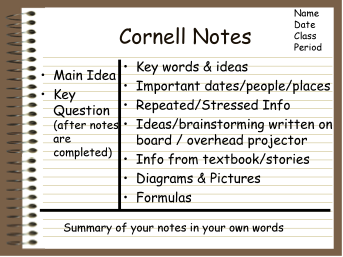 Students should then write the notes in the boxes they feel is relevant. This is really useful to see whether students are picking up on what are the M.I.P- Most Important Points in your lessons, whether they have linked the right examination questions and if their recall of previous areas of work is as strong as they need it to be! Click here for some other examples/further reading! I have written about notes/exercise books here where I list some other alternatives to the ways we have traditionally taken notes. And this contents page task is really useful too!